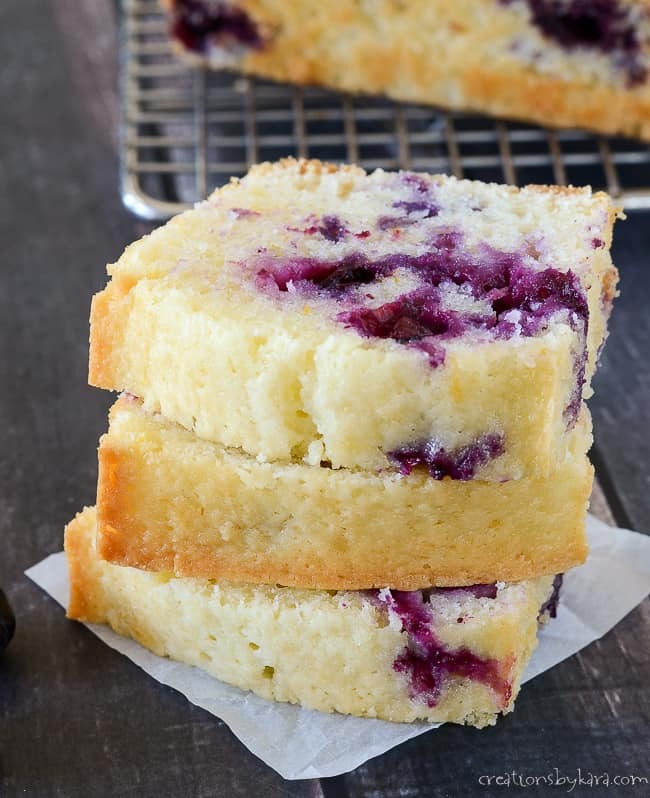 Lemon Blueberry Bread – with a tangy lemon flavor, and studded with juicy blueberries, this quick bread is unbelievable! Enjoy a slice any time of day. Blueberries are nearly impossible to grow here in Utah, so fresh blueberries usually cost a pretty penny. But my local grocery store had flats of blueberries on sale last week, so we have been enjoying blueberries for days! My son has been whipping up smoothies almost every morning, so I knew I’d better get baking before all the blueberries were gone. 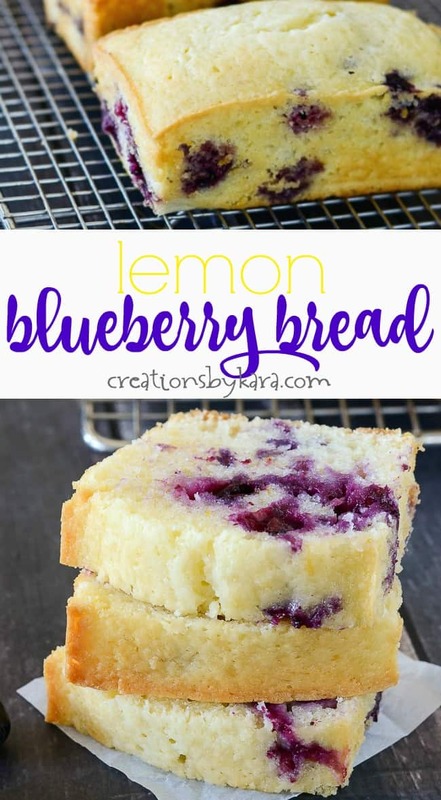 I enjoy blueberries in just about any form, but I really love them paired with lemon. Such a fresh and tasty combination, don’t you agree? 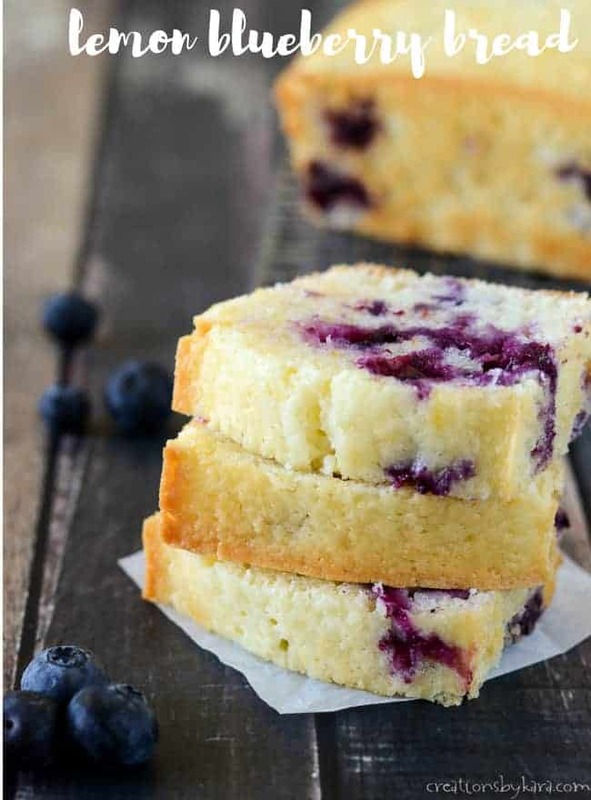 Lemon blueberry bread is so simple to make, you don’t even need to pull out a mixer. Just a simple whisk and mixing bowls will do the job. The hardest part is zesting your lemon, but if you have a great lemon zester even that job is a snap! 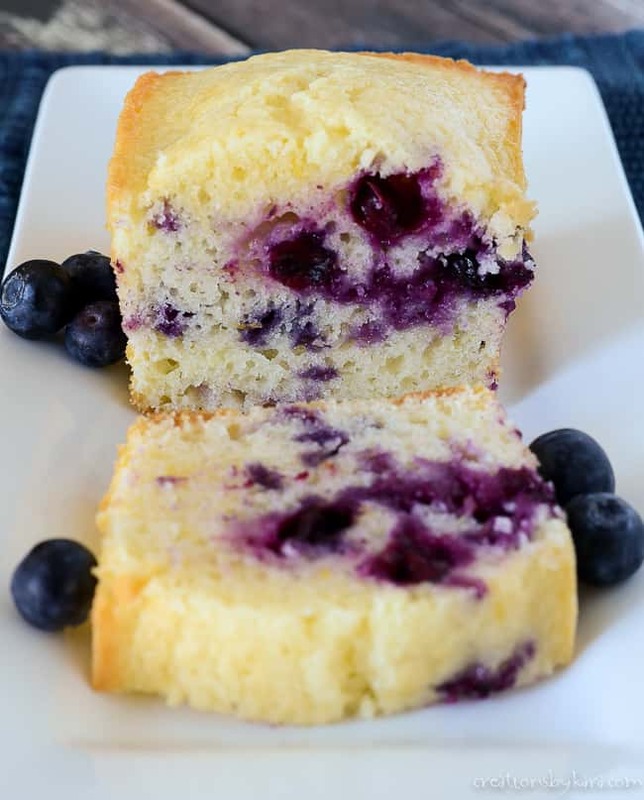 I really do prefer to use fresh blueberries in baked goods because they turn out so much prettier. Frozen berries tend to leave swirls in the bread. But that doesn’t affect the flavor, so if all you have is frozen berries, don’t sweat it. 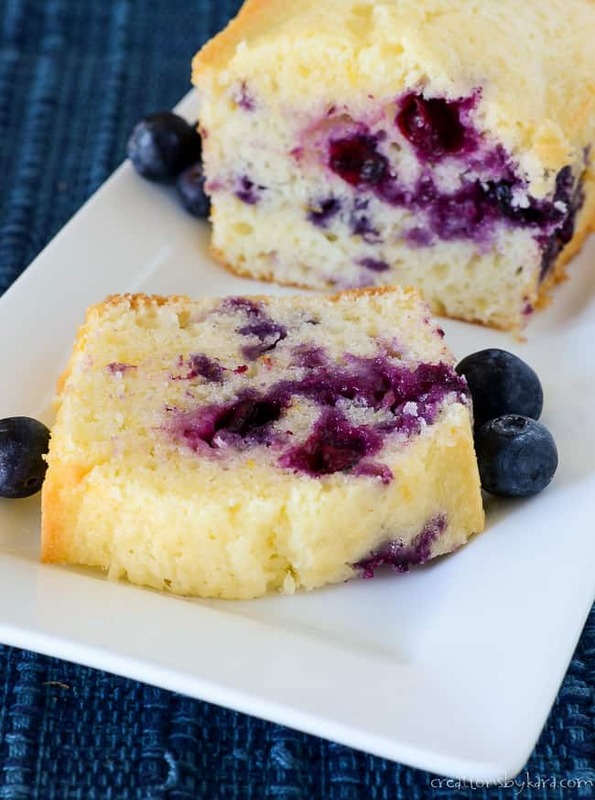 Every bite of this bread is loaded with lemon flavor and berries. I kept the leftovers in an airtight container and they were great for a couple days. Of course, the glaze does add an extra burst of lemon flavor, and makes the bread even more decadent, so if you have powdered sugar, go for it! – I’ve tried this recipe in a large loaf pan, but I had much better success with the mini loaf pans. -Spray your pans well, and line the bottoms with parchment paper. Nothing is more frustrating than a loaf that sticks to the pan and breaks when you try to take it out. -As with all lemon recipes, the great flavor comes from lemon zest. I stock up on lemons when they are on sale, zest and juice them, and freeze the zest and juice so I always have it on hand. 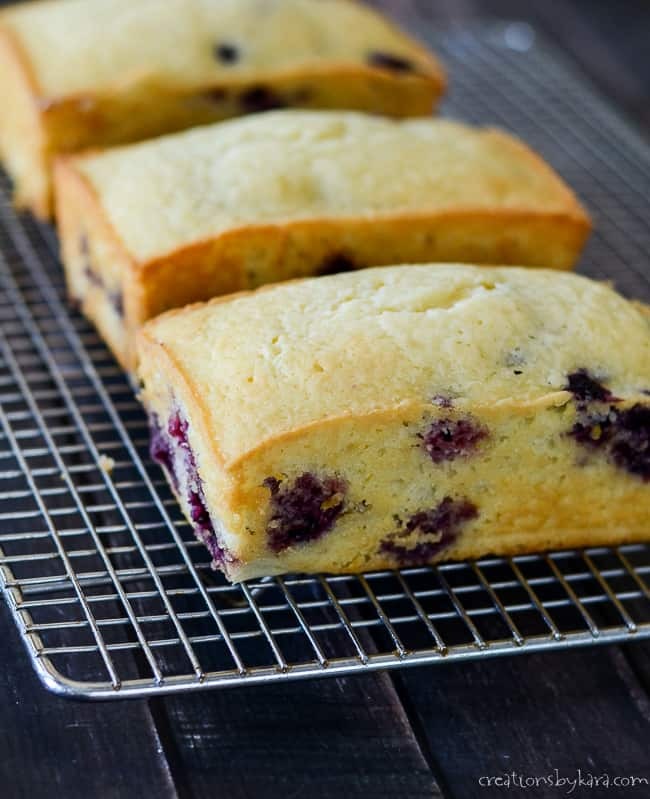 -Tossing the berries with flour helps prevent them from sinking to the bottom of the loaf. It also helps keep frozen berries from streaking your batter. -Don’t over-mix after you add the dry ingredients, or you may end up with a tough loaf. 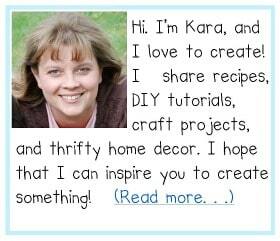 To see all my quick bread recipes, click HERE. 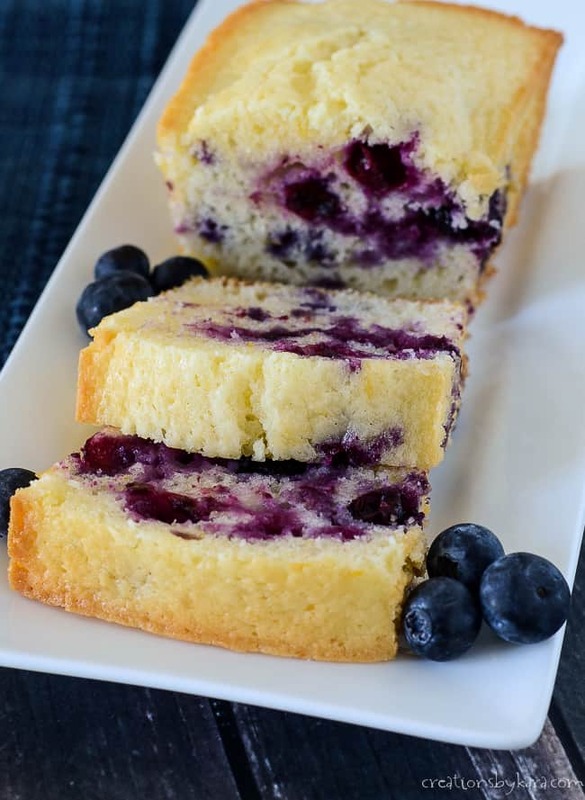 Moist and flavorful lemon bread studded with juicy blueberries. Spray three mini loaf pans with non-stick spray, and line the bottoms with parchment paper. Set aside. Whisk together oil and sugar in a large mixing bowl. Add lemon zest, lemon juice, eggs and sour cream; whisk till very well mixed. Divide batter between the three pans. Bake at 325° for about 40 minutes or until toothpick comes out clean. Cool in pan for 5 minutes, then remove to cooling racks. If desired whisk together the powdered sugar and lemon juice and drizzle over loaves. -My mini loaf pans are 5 3/4" x 3 1/4". Have you ever tried freezing these? Curious as to how they would freeze. I’m baking these today. We ate them fast enough that I didn’t need to freeze any, but I freeze similar quick bread all the time. Just make sure it is completely cool, then wrap it in plastic wrap. Place the wrapped loaves in ziplock freezer bags. I almost always have a loaf of quick bread in the freezer, and it is so handy! I loved this recipe! I read your blog fairly often and you’re always coming out with some great stuff! This is my favorite kind of bread. And thanks to this recipe I can make it myself! I am not sure why the ingredients list calls for sour cream or plain yogurt but the instructions don’t say when to add this. It’s not mentioned at all in the instructions. Was it added to the ingredients by mistake or is a step missing in the instructions? Used oil but found it confusing that the directions called for butter and pan size was unclear. My concept of mini is apparently different than yours. Should have looked at the Amazon website for dimensions, I quess. Had to guess at baking times. Bread was tasty. Kara. Please tell me if it should be oil or melted butter. I can’t wait to make this! I used oil, it makes a more moist bread. The melted butter in the instructions was a typo. Sorry about that! I love anything & everything with lemon & blueberry. These look so delicious and perfect for gifting too!